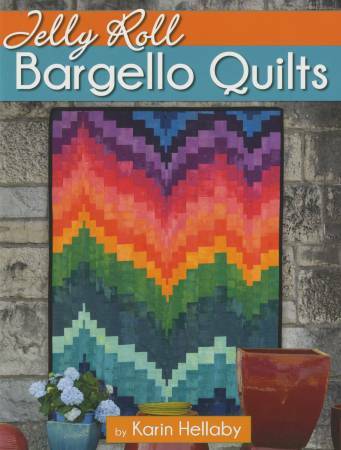 Welcome to the world of Bargello, a style of quilt that is reminiscent of the Op Art of the 1960s, filled with movement and the illusion of depth thanks to the placement of the fabric's color and value. In fact, they’re inspired by a type of straight stitch embroidery found in the Bargello Palace in Florence, Italy. Deceptively complex-looking, bargello quilts are easy enough for beginners, and easier still combined with pre-cut strips of 2-1/2in wide fabric. Karin Hellaby’s newest book, Jelly Roll Bargello Quilts, explains the process clearly with easy-to-follow instructions, visual diagrams, and step-by-step photography. Karin, a world-renowned quilt making instructor, takes the reader on a journey through over 14 small projects such as table runners, pillows, wall-hangings, and lap quilts.